Robert Rossen directed this masterful screen version of Robert Penn Warren's Pulitzer Prizewinning novel. 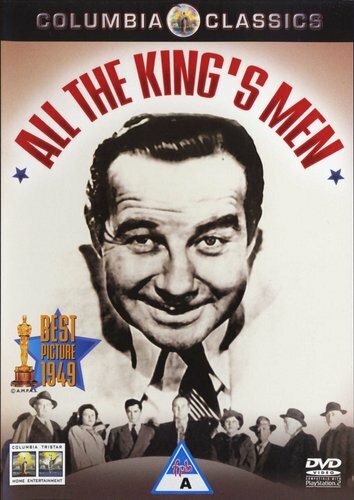 The movie won three Oscars: Best Picture; Best Actor (Broderick Crawford), and Best Supporting Actress (Mercedes McCambridge), while John Ireland was nominated as Best Supporting Actor. The film also received Oscar nominations in the Best Editing and Best Screenplay categories. The character of Willie Stark, played by Broderick Crawford, is loosely based on real-life Illinois senator Hughie Long. It was one of the first Hollywood productions to deal in depth with political corruption in high places. John Wayne was originally earmarked for the Willie Stark role, but turned it down because he considered it "unpatriotic" and also because he could not get along with Harry Cohn - the then notoriously dictatorial boss of Columbia Pictures. And although winning an Oscar for giving the performance of a lifetime: burly Broderick Crawford was a difficult man to cast, and remained in relative obscurity until quite late in his lifetime when he found rekindled fame as FBI chief, J Edgar Hoover, in an American TV series. Also in the cast is a very young John Derek. Verdict: a classic, and essential viewing for anybody even remotely interested in the cinema! 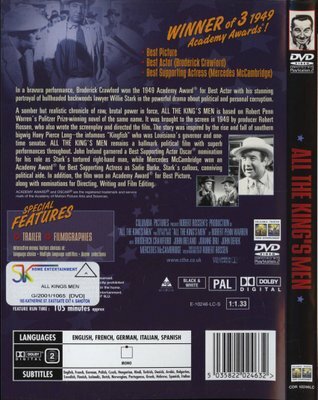 All The King's Men is the story of the rise of politician Willie Starks from a rural county seat to the spotlight. Along the way, he loses his initial innocence, and becomes just as corrupt as those who he assaulted before for this characteristic. Also included is the romance between one of his "right hand women" and the up-and-coming journalist who brings Starks to prominence.